you are very well prepared. I keep essentials, but not as many as you. I never unpack camping gear until November so have all of that with me. oh dear... i think i need to organise a car emergency kit too!! I need to update and add some things. I had a kit when I worked for the health department because we were so preparedness minded. Need to get back to that. I love this! It is something I have been thinking about a lot lately, yet haven't done much to remedy our non-preparations. I have been building our emergency supplies in our home, but not in the car. What do you have for a water purifier? I was thinking about getting some life straws for everyone. I confess, I do not have a kit in my car. I so admire you for having yours and the items in it are very important. Because every idiot in America drives. Yep though I should go thru it again and replace/refill some items that I know have been used. That is impressive! I keep a heavy coat, boots and glove in the winter but I really don't drive much anymore. It is a good idea in case of a brush fire when they force you to evacuate, those supplies would get you to some other location. Maybe a $20 bill would be good as well. I had to stop by and tell you what a great gift it is and what a great idea it is too. i have several items packed in my car (jacket, gloves, umbrella, towels, dog leashes and biscuits - for rescues) but just got a new/used truck that i need to add a few things to for safety's sake. thanks for the good reminder! Good thinking Lisa! I don't have an emergency kit in my car. In the last year my commute has increased and now that it is coming in to the winter I will have a think about what I need to always carry in my car for emergency. I do. I keep everything I would need to spend the night out in the Jeep and the truck. I also carry food, water, emergency road items like flares. Your emergency kit looks like you have all the bases covered. I want to add a "come along" to my truck kit, I have one in the jeep. I always have an entrenching tool and some chain as well, for unditching. 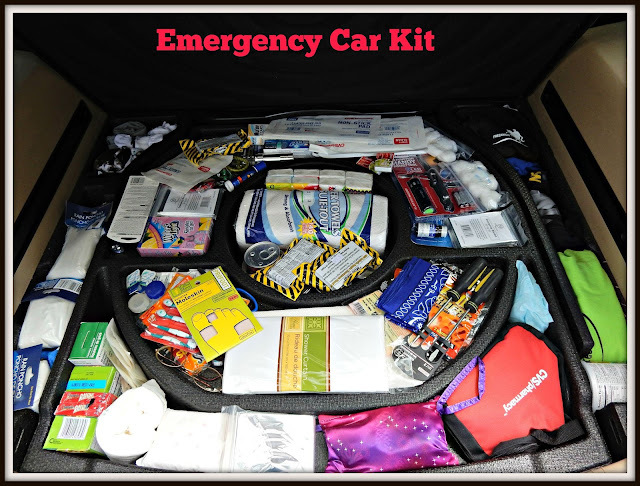 I have given emergency car kits to both my daughters in the past. There are things every motorist should have! what an excellent idea, I remember my Mom and Aunts all had emergency kits that were packed in small wooden boxes that our Dad's had made so nothing like yours though...quite impressive! Wow!! Look at all that! You are definitely prepared, smart idea. No, but this reminds me that we should. Thank you! Thanks for the tips! I've been wanting to put one together, but wasn't sure what to gather for it. this helps. Thank for reminding me about that! You are certainly prepared! I do have a stash of stuff in my car, but some things definitely need restocked! I do. I know my husband takes a bigger one when we go camping. I'll have to work on one myself as well, no joke with a small baby and winter in Finland!